Asbestos does not occur naturally in Florida, but large amounts of it were shipped to the state and even more contaminated products were used commercially in construction and other industries. According to records, at least 109,949 tons of asbestos were shipped from Libby, Montana, for processing in five Florida cities: Boca Raton, Jacksonville, Pompano Beach, St. Petersburg and Tampa. Hundreds of Florida buildings harbor asbestos-containing materials (ACM), but as long as they are not damaged or disturbed, they are considered nearly harmless. However, many business and property owners in the state have taken steps to remove the asbestos from their buildings out of fear of harm to the public. The number of asbestos lawsuits filed (and won) in Florida is also a motivator to prevent harmful exposure. Others have left the materials in place, and instead, developed awareness and management programs, which help to manage the asbestos at these facilities. Aside from the five asbestos processing plants that previously operated throughout the state, other industries such as construction and mining used asbestos extensively in the workplace. Those with jobs at shipyards, power plants, chemical plants, metal works factories and auto repair shops were likely to encounter asbestos in the workplace as well. Occupations in schools, electrical work, plumbing and home repair also present a risk of exposure. Some of the known locations where exposure was a risk include Big Bear Powerhouse, Crist Power Plant, DuPont Corp. (Forest Wheeler), Eustis Housing Project, Jacksonville Grammar School, Mulberry Phosphate Mine, St. Lucie Nuclear Power Plant, U.S. Sugar and Vero Beach Municipal Power Plant. The National Aeronautics and Space Administration (NASA), nestled in Florida’s central East Coast, has also used asbestos, particularly for fireproofing purposes on the space shuttle. Technical reports released by NASA indicate that asbestos blocks have been used as soldering bases, and asbestos composites have been used in pressurized vessels. Many public buildings also contain asbestos, and Florida laws and regulations are in place to help prevent exposure and make the right entities responsible for containing or abating the materials. For example, Florida State University (FSU) has identified several buildings that house asbestos-containing material. FSU manages the materials under the guidance of the Environmental Protection Agency (EPA). This is just one example of the effort put forth by facilities in the state. The state itself has made great efforts to monitor and manage known asbestos sites by implementing a special program. The intent of the Florida DEP Asbestos Removal Program is to prevent the release of fibers to the outside air during renovation and demolition activities. The program began in 1982 when the EPA delegated enforcement authority to the state. 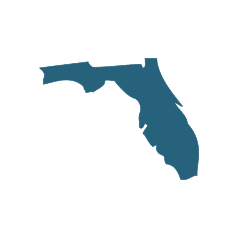 It requires notification to the Florida DEP about the removal of asbestos from certain types of facilities throughout Florida that have the potential to contain contaminated materials. These include institutional, commercial, public, and industrial structures and residential buildings with four or more units; as well as ships or any active or inactive waste disposal sites. It doesn’t take much to earn the label “asbestos-containing.” In the state of Florida and across the country, all forms of asbestos (even in small amounts) are considered dangerous. Asbestos-containing materials refer to any materials that contain more than 1 percent asbestos. Florida has set laws in place to regulate the removal of such materials, with some hefty penalties for violating these laws. The Department of Environmental Protection sets non-compliance fees high. Currently, financial penalties are the only punishments for skirting the law. If an individual or individuals are harmed during the removal of asbestos from any site in the state of Florida, filing a lawsuit is the only recourse. Financial penalties are assessed for failure to comply with notification laws, waste shipment violations, and work-practice and emission violations. Penalties depend on the specific type of violation and whether it’s the first, second, or third violation, and range from $500 up to $10,000. Florida residents thankfully don’t have to be concerned about environmental sources of asbestos since the mineral does not occur naturally in the Sunshine State. However, exposure through contaminated products is a possibility, and becoming informed about how to prevent exposure is the best approach to avoid contact with the toxic mineral.